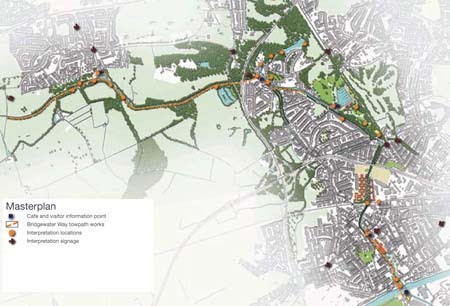 URBED with Landscape Projects developed a masterplan as part of a series of studies commissioned by Salford City Council to transform the 4.9 miles of the Bridgewater Canal that run through the city. The section of the canal in Salford, is arguably the most historically important canal in Britain. It is taught to every child as part of the National Curriculum and could be said to have kick started the Industrial Revolution. Yet for most of its journey through Salford you wouldn’t know this. The canal, as a contour canal, has no locks and little of the historic architecture and infrastructure that you find on later canals. Much of the towpath is muddy and the canal edge is steel sheet piling rather than stone. The eastern part of the canal feels run down and, while the western part is much more rural, with the exception of the centre of Worsley, it is not particularly picturesque. The masterplan completed in August 2010 This is an aspirational document that aims to transform this situation and to turn the canal into an attraction used by a broad range of people from local dog Walkers to international visitors exploiting its history and fame. In the long term there is potential to open up the 46 miles of underground canals on four levels under Worsley Delph and to combine the Barton Swing Bridge with a museum charting the history of the Bridgewater and Ship Canals making the canal one of the region’s biggest attractions. This however does not need to happen in one big bang and the lesson of many of the Millennial Lottery projects is that visitor numbers often fail to live up to expectations and business plans prove unrealistic. 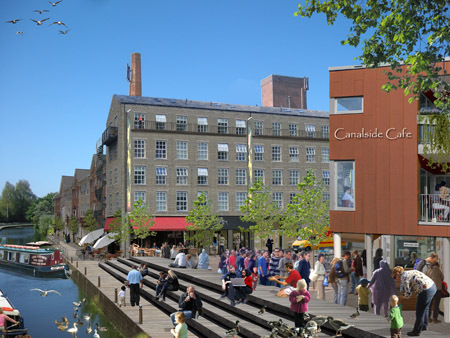 The vision for the Bridgewater Canal is therefore to develop the attraction and the number of visitors gradually over time, appealing first to local visitors, before widening this to the city, then the region and only then nationally and internationally. 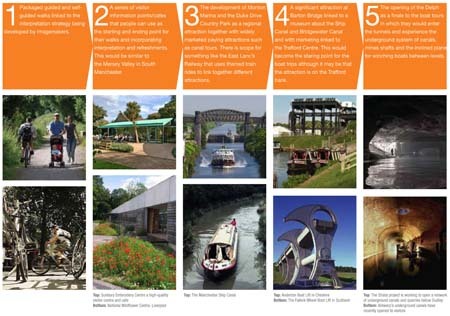 The strategy envisages the canal being developed in 5 stages: 1. Packaged guided and self-guided walks linked to the interpretation strategy being developed by Imagemakers. 2. A series of visitor information points/cafes that people can use as the starting and ending point for their walks and incorporating interpretation and refreshments. This would be similar to the Mersey Valley in South Manchester. 3. The development of Monton Marina and the Duke Drive Country Park as a regional attraction together with widely marketed paying attractions such as canal tours. There is scope for something like the East Lanc’s Railway that uses themed train rides to link together different attractions. 4. A significant attraction at Barton Bridge linked to a museum about the Ship Canal and Bridgewater Canal and with marketing linked to the Trafford Centre. This would become the staring point for the boat trips although it may be that the attraction is on the Trafford bank. 5. The opening of the Delph as a finale to the boat tours in which they would enter the tunnels and experience the underground system of canals, mines shafts and the inclined plane for winching boats between levels. Salford City Council has been awarded £3.6m from the Heritage Lottery Fund towards the project cost. This will cover the first three phases of work as set out in our report. 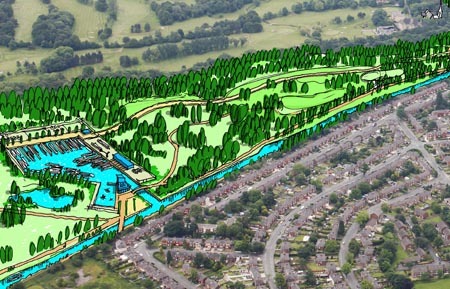 The project will stretch along five miles of canal between Boothstown and Barton. The council has also secured funding from a mixture of private and public sources. Engineer James Brindley designed the aqueduct to carry the canal over the River Irwell. Barton Aqueduct will be restored and the historic structure will be lit for the first time. Worsley Delph, where coal-carrying barges emerged from the Duke of Bridgewater's mines, will be re-opened to boats and visitors. There will be new paths, an events programme and a new playground in Dukes Drive Country Park.